These stocks were the worst performers last year. 2016 was a good year for the Dow Jones Industrials (DJINDICES:^DJI), which finished with a 13% gain that left it just shy of the 20,000 mark. Yet even though the Dow gained more than 2,300 points on the year, some poor-performing stocks held it back from posting even bigger returns. Among them, Nike (NYSE:NKE) and Coca-Cola (NYSE:KO) were the only two stocks to post outright declines in 2016, but Disney (NYSE:DIS), Visa (NYSE:V), and Home Depot (NYSE:HD) didn't manage to produce anything more than token returns during the year. 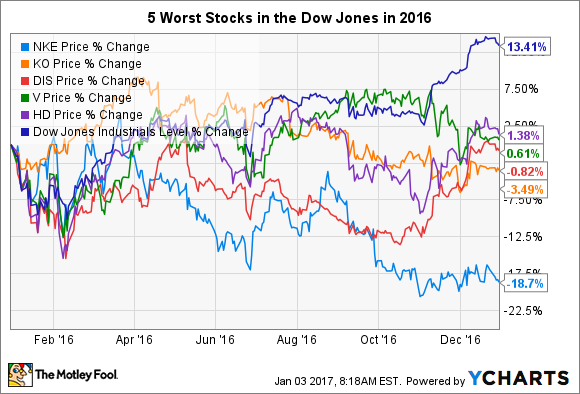 Let's look more closely to see why these five stocks were the worst in the Dow in 2016. At first glance, these five stocks don't immediately have a lot in common. Yet all of them had to deal with changing market conditions that posed new threats to their leadership positions in their respective industries. For Nike, the athletic footwear and apparel giant has seen rivals emerge on a number of fronts, including the emergence of domestic up-and-comer Under Armour as well as the resurgence of longtime global opponent Adidas. Despite strong growth in overall sales generally and in direct-to-consumer revenue in particular, falling gross margin figures at Nike have spooked investors, who have long counted on the company's ability to squeeze the most profit possible from its huge investment in its brand name and reputation. Weakness in future orders also seemed to chip away at Nike's past dominance, and with the stock still sporting a high multiple, Nike investors weren't willing to take any chances despite the company's longtime track record. Coca-Cola, meanwhile, has been facing some major issues for quite a while now. Concerns about the falling popularity of its namesake carbonated soft drink lines eventually led to the decision to replace outgoing CEO Muhtar Kent, and James Quincey will take the top seat at Coke in May. Despite some success in cutting back on the sizes of its sugary products, Coca-Cola has also turned to still beverages in order to diversify, including water, tea, and juice. Its investment in energy drink giant Monster Beverage also promises to keep it exposed to that high-profile segment. Nevertheless, with the global giant also suffering from the strong dollar, shareholders can expect further pressure on the beverage company until it can get things turned around completely. Disney, Visa, and Home Depot managed to gain a slight amount of ground in 2016, but they too have had to deal with competitive issues. For Disney, the long dominance of its ESPN sports franchise has faced doubt related to the cord-cutting trend in cable television, with some investors worried about how long the company will be able to benefit from its leverage in negotiating lucrative deals with cable television providers. Higher costs and new competition for the most prestigious content also poses threats to its television segment. Still, it's hard to discount the amazing growth potential the company's entertainment studio division has in generating the very content that will show up in those key distribution channels, and the stock's recent resurgence back into positive territory for 2016 came largely from investors recognizing that fact. The reasons for Visa's underperformance aren't as obvious, but several trends have conspired to hold the electronic payments giant's stock in check. As positive as falling gasoline prices have been for economic growth in the U.S., they've also resulted in pressure on a key part of Visa's business domestically. Meanwhile, in Visa's global network, the same currency headwinds that have hit many multinationals that sell products overseas have also eaten into the electronic payment company's financial results, because even strong organic growth doesn't produce better profit and sales gains if the local currency is deteriorating. Overall, Visa still stands to benefit from increasing adoption of its payment technology across the globe, and that should produce long-term positive results despite 2016's setback. Finally, Home Depot has seen years of growth related to housing's strength. Yet once again, the fear of higher interest rates has spooked some investors into thinking that the housing market could give back some of its recent gains. At the same time, Home Depot has already seen its past growth rates slow, and some question its strategic decision not to emphasize expansion in its store counts in favor of taking full advantage of other growth initiatives, like omni-channel marketing through its website and mobile offerings. Many investors are waiting for macroeconomic uncertainty to abate before making definitive calls on housing and Home Depot. In general, the negative factors that held these stocks back in 2016 are short term in nature and won't affect the long-term investing propositions that all five of these companies offer. Moreover, all five of these companies have adapted to changing conditions in the past and found ways to move forward. Of the five, Coca-Cola's challenges are the most fundamental, and they'll need the strongest response. Yet if these companies start to perform as well as they have in the past, they could end up leading the Dow to even higher heights in 2017 and beyond.